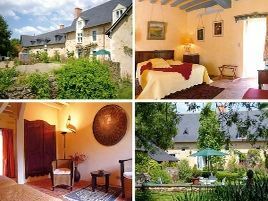 Set in 70 acres of woods and pastures, the Manoir du Bois de Grez is a typical example of the country houses of the 15th and 16th century in the Anjou region. Marie-Laure and Jean-Gaël have renovated their residence with great enthusiasm using only traditional materials. Lovely garden with lake. The spacious, bright and airy rooms are attractively decorated, each with its own style. Warm, ready welcome by hosts eager to help you discover the delights of the Anjou region. .
- massage de relaxation en week-end. - initiation au massage bébé sur un week-end. - golfs Blue Green d'Avrillé et Anjou golf Country Club à 15 km. 4 rooms with bath or shower, WC and TV. 75 euros (1 pers. ), de 85 à 95 euros (2 pers. ), 115 euros (3 pers. ), 135 euros (4 pers.). Extra bed 20 euros. Baby equipment, babysitting, games, children's meals (on demand). For teenagers: tennis, pony trekking, Parc Aventure amusement park. Two family rooms. The closest station is Angers TGV, located at 20 km. The closest airport is Angers-Loire , to 30 km.